I’m taking a deep breath today. These past few weeks have been so busy, so today I’m going to share a card with you that I had intended to share a few months ago, but had quite forgotten about (yikes! Mom brain strikes again!) It’s made entirely from a super super cute Mama Elephant set: Charmed. I received it a while ago (last summer maybe?) and immediately created this card with it, but promptly put it in my “finished” box and forgot about it! 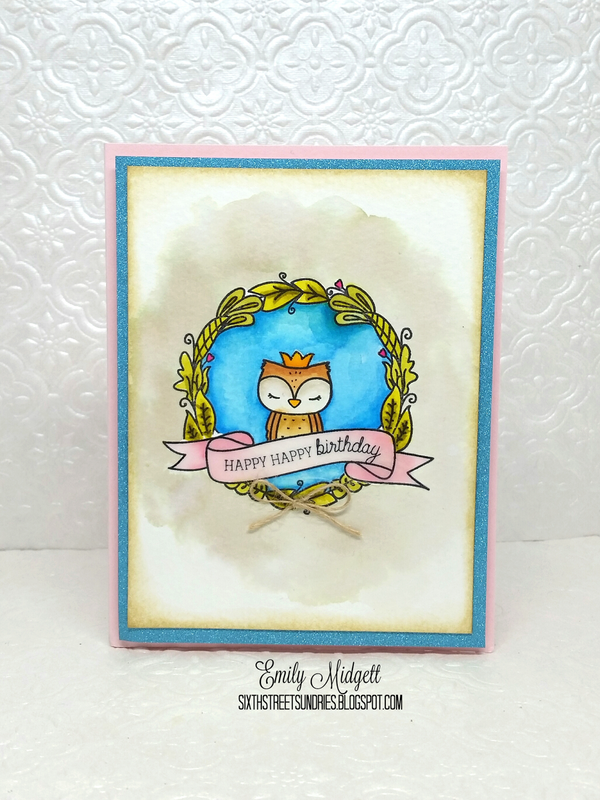 This card’s creation is fairly simple: a bit of stamping, a bit of masking, and some watercolor. To start, I stamped the lovely banner image with black Archival Ink, both on a panel of watercolor card stock and a piece of Post-It paper. I cut out the banner on Post It paper to use as a mask, then placed it over the banner on the watercolor paper. The rest of the stamping was normal. I stamped the wreath, then the owl, so that the parts that I wanted behind the banner would be hidden by the mask. I removed the mask and used my Zig Markers and Distress Inks to do some watercoloring. To create the kind of cloudy look around the wreath, I first wet my card stock, then added (very) diluted Pumice Stone Distress Ink that I’d tapped onto a clear block and diluted with lots of water. I simply dropped the color in on the wet card stock and allowed it to spread where it wanted. To age the panel, I swiped the edges with Papertrey Ink’s Tea Dye Duo. I mounted the owl on a panel of sky blue glitz paper, then popped the whole panel up on a cotton candy pink card base. I added some Glossy Accents to the banner and berries, as well as a little twine bow to complete the project. I have a whole set of these in various colors on my never-ending list of “projects to make.” Hopefully, one day, I will find the time to make these. Sounds like a good project for when my mojo has taken a hiatus, as it is wont to do. A little watercoloring always does a body good, yes? I hope you enjoyed this simple little project! I am not normally one for the cartoon-y animal stamps, but I couldn’t resist this sweet little owl. I have plans to just kinda chill out in my craft room over the next couple of weeks… going to play with some stamps that haven’t seen any love, do some organizing, play with my Foldio and try to get my blog photography up to snuff.